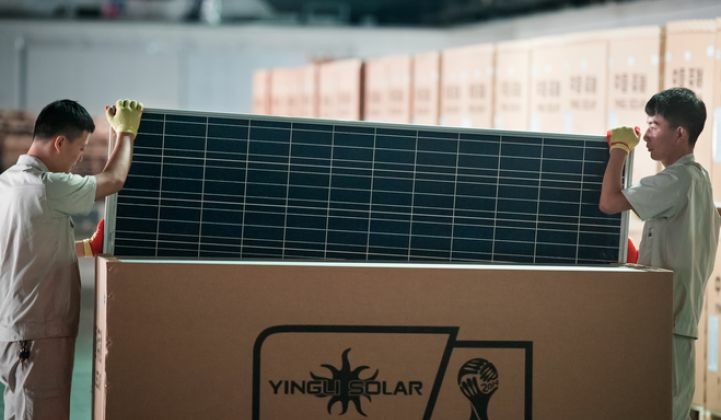 Yingli’s plan to deploy more panels into China may not alleviate the company’s financial problems. Can Yingli Solar turn itself around? That's what analysts are asking after the world's second-biggest solar manufacturer issued a warning about its worsening financial health earlier this month. Yingli, a vertically integrated PV producer based in Baoding, China, expanded operations and shipments rapidly over the last five years -- making it the top supplier in 2012 and 2013. But that growth has also become a liability. Yingli took on more debt than it could handle as it expanded into polysilicon production and broadened its geographic reach. While other leading Chinese manufacturers Canadian Solar, JinkoSolar and Trina Solar are now posting profits, Yingli has lost money for three years in a row. "Facts and circumstances including recurring losses, negative working capital, net cash outflows, and uncertainties on the repayment of the debts raise substantial doubt about our ability to continue as a going concern," wrote the company in its recent 2014 annual report. As onlookers assess the seriousness of Yingli's financial problems, attention is shifting to how the company can rebound. In the short term, Yingli may pay off some loans by selling stock to top shareholders or by taking on additional loans from shareholders. Longer term, however, the company will need a more consistent source of cash to service its $2 billion in debt, which some believe could come from project development. In a recent note, IHS researchers wrote that a downstream focus "could reverse [Yingli's] fortunes, particularly as the solar industry recovers further in 2015 and demand remains high in its domestic market." Could building solar power plants save Yingli? On paper, Yingli has built up a strong development business. It currently has 1.6 gigawatts of projects in various stages of planning and construction. The vast majority of those projects are in China, where countrywide demand is expected to reach 14 gigawatts this year and 24 gigawatts in 2020, according to projections from GTM Research. The Chinese government is looking to promote 100 gigawatts of cumulative installations by the end of the decade. The expanding Chinese solar market will certainly help a company like Yingli in need of stable sources of cash. But China is far more complex than the top-level numbers suggest -- making that desired stability difficult. Under China's feed-in tariff for solar, developers get paid two ways: an upfront incentive from the local utility based on the market price of coal, and a "top-up" incentive from the government. The second payment is the difference between the market price for coal-fired electricity and the national feed-in tariff price between $0.15 and $0.16 per kilowatt-hour. The first payment is paid monthly and is usually on time. However, the second one is chronically delayed because of administrative issues. "China's method for collecting subsidies is a bureaucratic process wherein local governments collect surcharges and the national government processes and redistributes them. It leads to a really long backlog for payments," said Adam James, global PV demand analyst with GTM Research. The Chinese government may be setting ambitious targets. But that doesn't mean the industry will hit them. Last year, for example, the country increased its yearly goal to 14 gigawatts. However, only 11 gigawatts were actually developed and connected to the grid, partly because of the backlog and partly because of interconnection delays. In its Q4 earnings report, Yingli reported shipping 73 megawatts of PV modules to projects in China, and 260 megawatts for all of 2014. The company is hoping to fully connect 400 to 600 megawatts' worth of projects to China's grid this year. But as Yingli admitted in its risk reporting, grid connection and payment are not always aligned in a timely way in China: "Delays between upfront investments and generating revenue may adversely affect our cash flow." In other words, a large downstream portfolio in China could actually be risky. "Yingli is exposed to risk in China because it has a big pipeline there, short-term debt, and needs project cash flow," said James. "The downside risk is that demand may be slightly weaker than expected due to structural problems in the market that will hit cash-strapped Yingli particularly hard." There are other risk factors in China beyond payment delays. Those include steep reductions to the feed-in tariff, tightened credit due to poor real estate investments by Chinese banks, and problems with poor-quality modules hurting the industry's reputation and scaring investors away. China will still see strong growth despite these challenges. In its upcoming Global PV Demand Outlook, GTM Research sees an upside scenario of 25 percent compound annual growth through 2020 as most likely. That's an obvious place for Yingli to build new business. But the immediate revenue potential isn't as obvious.